Reception for this event is Saturday, September 29 from 2:00-4:00pm. Also featured is the Grand Opening of the Bowen Gift Gallery – just in time for the Holiday Season. This year’s challenge quilt series is Americana. 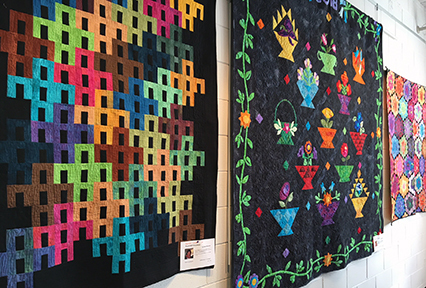 Take a tour of over 80 handcrafted quilts prepared by members of the Heart in Hand Quilt Guild. Members are from Dawson, Hall, Lumpkin, Pickens and Forsyth Counties. Vote on your favorite from all the beautiful needlework hanging from all corners of the Bowen. Docents will regale you new and old timey stories, as well as technical details of their craft. The Guild is a non-profit group dedicated to promoting the art of quilting through teaching, learning and exchanging ideas – and of course – fellowship. Join this lively group at their monthly meetings which are held the second Tuesday at 6:30pm at the Bowen. Don’t miss their Raffle Quilt donated to the Bowen now on view. This quilt was produced by over 45 Guild members. Tickets for the king size quilt are $1.00 each or 6 for $5.00. Drawing will be held December 12, 2018.